Here’s what’s up in the world of TV for Thursday, October 8. All times are Eastern. The Vampire Diaries (The CW, 8 p.m.): At the launch of its seventh season, The Vampire Diaries is starting a new chapter. 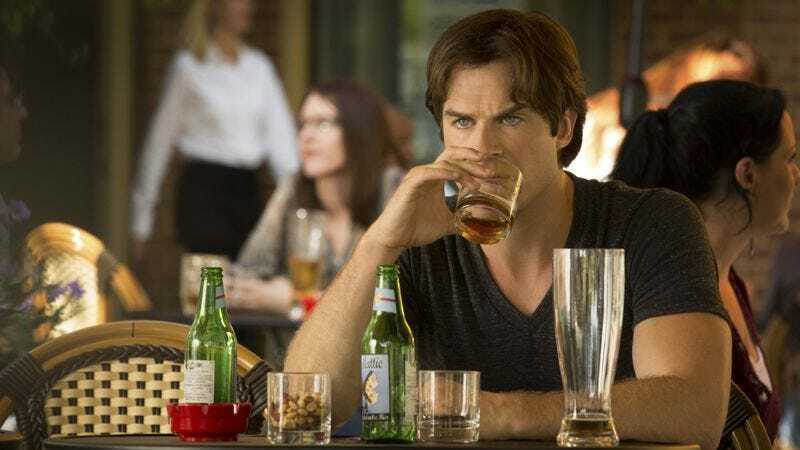 The show may have found an elegant way to get rid of its protagonist last season, but continuing on without Elena Gilbert is a whole new challenge. We asked Carrie Raisler to check in on Damon and make sure he’s doing okay (and based on this header image, he might not be). Elsewhere, Lily and her family of Heretics wreak havoc on Mystic Falls, Stefan and Caroline team up with Matt, and Enzo keeps on Enzo-ing. Heroes Reborn (NBC, 8 p.m.): Last week, guest reviewer Myles McNutt called Heroes Reborn “a mess.” Now back on her regular beat, Kate Kulzick weighs in on Noah’s latest attempt to learn about his past and the increasingly strained relationship between Luke and Joanne (funny how spree-killing will do that to a marriage). Comedy Bang! Bang! (IFC, 11 p.m.): Uzo Aduba stops by Comedy Bang! Bang! to perform her stand-up act. While that’s likely a set up for her to awkwardly bomb, LaToya Ferguson is convinced there’s actually nothing Uzo Aduba can’t do. In the end, what’s most disappointing about SuperMansion’s first episodes is how underdeveloped its superhero milieu is. If Robot Chicken’s joke-a-minute structure encouraged disposable, rapid-fire zingers, SuperMansion’s expanded storytelling offers the chance to craft a more developed superhero satire. Instead, the show more often plays like a clayey version of the late, unlamentedDrawn Together, which also banked on the idea that a houseful of crude fantasy characters (including a superhero) doing and saying would-be shocking things would never not be hilarious. The Originals (The CW, 9 p.m.): After two seasons, The Originals is starting to feel slightly less original. But perhaps a serial killer will help liven up the third season premiere. Haven (SyFy, 10 p.m.): The second half of Haven’s fifth and final season kicks off on SyFy. A mysterious fog has everyone trapped in Haven, which is probably how the cast has felt for the past five years. Middle Of The Night Show (MTV, 11 p.m.): In MTV’s latest attempt to make talk shows hip and relevant, camera crews “unexpectedly” barge into celebrities’ bedrooms in the middle of the night and force them to host the show on the spot. Thomas Middleditch kicks things off, thus making this premiere the Middleditch Of The Night Show. Wanda (TCM, 8 p.m.): Barbara Loden writes, directs, and stars in this 1970 drama about a housewife who leaves her family and takes up with a bank robber. Wikipedia calls it “seldom seen, but strongly admired,” so get in the know about one of the few feature films directed by a woman in the late 1960s/early 1970s. American Horror Story: Hotel: Emily L. Stephens puts on her best Poker Face to check out Lady Gaga in American Horror Story: Hotel.